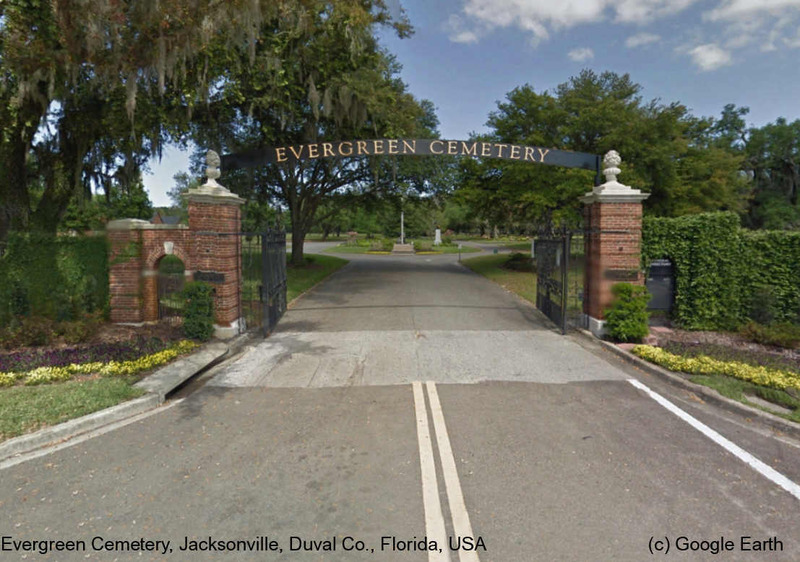 Evergreen Cemetery is the oldest fully operating cemetery in Jacksonville, Florida. The first burial took place in 1881. The Evergreen Association was organized in 1910 as a non-profit corporation and purchased Evergreen from a privately owned corporation. The cemetery is comprised of 170 acres and over 70,000 burials. When the cemetery was opened, remains were moved here from a downtown area near State Street and from the Old City Cemetery. This cemetery has several sections for fraternal organizations and churches. There are two sections set aside for the Hebrew faith. Temple and Old Jewish Center are within the same walled area within Evergreen Cemetery. There is no physical distinction between Temple and Old Jewish Center, so it is impossible to tell where one begins and the other ends. The area is separated from the main Evergreen Cemetery only by a low brick wall. Temple is an old Jewish Reform cemetery belonging to, established and maintained by Congregation Ahavath Chesed (The Temple). It is physically located within Evergreen Cemetery. It is adjacent to Old Center Cemetery, an old Jewish Conservative cemetery, which belonged originally to Congregation B'nai Israel. The Cemetery gate on Winona Street for Old Center Cemetery has been sealed so access for Old Center Cemetery is through the Temple Cemetery gate. Evergreen also includes the old Woodlawn Cemetery and Mount Olive, an African American section. Evergreen Cemetery also functions as an arboretum, a tree sanctuary used for educational purposes. Efforts are underway to place a marker by every tree, with a number, common name, scientific name and a brief description.